That's the harsh reality of depression and addiction, it's a disease that's always there. It never goes into remission, it doesn't have a cure and it's not something that will ever let up. No amount of drugs, therapy or even praying will ever make a person 100%. So much is being made of the Lamar Odom situation where people are criticizing him for not getting help sooner so that he could've prevented being in the situation he's in right now. First that's really insensitive to say to someone that's fighting for their life, no matter how much hindsight folks are using at this point. This man is a father, a husband and a host of other things to other people. Secondly it's ignorant because you don't know him personally so you don't know how many times he's been in rehab, which has been quite a few times. Thirdly it's disrespectful in the fact that people who've never had to fight through one of these things say how easy it is to defeat. If you don't have those demons in your closet to fight on a constant basis then I hope you're never in that position to see first hand how hard life is and how little of hope there is of it getting better. Speaking from a person suffering from PTSD, onset depression and social anxiety, I only get through my days through a lot of praying and constant support from family and friends. Lamar has never had anything like that, it's been no secret that people had their hands out since he started out on his course to the NBA. He's taken care of so many people and there are so many other people that have influenced him to do wrong that it's hard to not understand why he turned to other things to try and be happy. I've said this time and time again, people will only know what to do based off what they see and learn. If you were subjected to the worse of life for most of your life then you will only know that. No matter how far you go or how much money you make, your demons will always be there. Losing things left and right all of your life, despite how good for yourself will wear any human being down, regardless of who you are. I mean people deal with it everyday and you would never know by the way they carry themselves, but that's because they are so use to it that they know how to hide pain. Up until I went into therapy for myself I didn't know that having those coping mechanisms were in fact just a form of depression that I was ignoring. 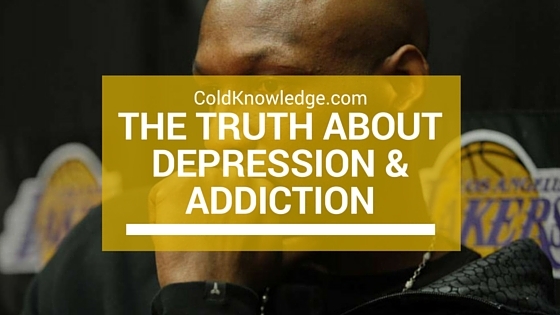 Depression and addiction are two things that will never have a great outcome when paired together. When I was in the military I had access to a multitude of pain killers due to the fact that I sustained a major injury and never took time to recover from it. Instead of taking time to myself and getting the help that I need to get better, I just masked the pain that I felt physically and mentally by drugging myself on a daily basis. And contrary to anyone serving in the military say, there are a ton of people either smoking, drinking or popping prescription pills to hide some form of pain. That's the culture of the United States Military because a lot of death and loss will make a person go to that level. So if the military is like that, imagine what being a professional athlete is like. Being famous is no short task because there will forever be a group of people living vicariously through others and will forever critique them for any and every single thing they do. Most athletes don't understand that part of fame fully, so when most encounter it they don't know how to react and he was essentially thrown to the wolves with the combination of early life struggle, being an athlete and being in a culture that doesn't necessarily provide a positive one. But like anything in life, depression and addiction are manageable as long as the person wants to get help and has a good support system. It's no secret that Lamar wanted help all along, it was just the people who he was around that held him down. And I'll tell you now, even the greatest of people who have the toughest mental fortitude around can be bough down by the very people they love. Love is a tough pill to swallow, it can either make you or destroy you, and in this sad case it only tore away at him until something like this happened. I could list all of that in which he went through but that would be insensitive nor does it even matter in this context at this point. He's a human and as a human who has done so many great things for people he deserves the most respect, privacy, prayers and well wishes as the next person. I do pray and wish for the speedy recovery of Lamar, all the people rushing to his side shows you that he still loved and cared about. I hope the people criticizing and making jokes about this never go through this because it's a scary thing to go through, and I don't think any of them will be able to handle it if they were thrown to the wolves like that. If you are a person of need or help, but you don't know where to start or where to go, here are a few numbers for you to call, and just remember that the first step is knowing you need help, the second step is asking for it.